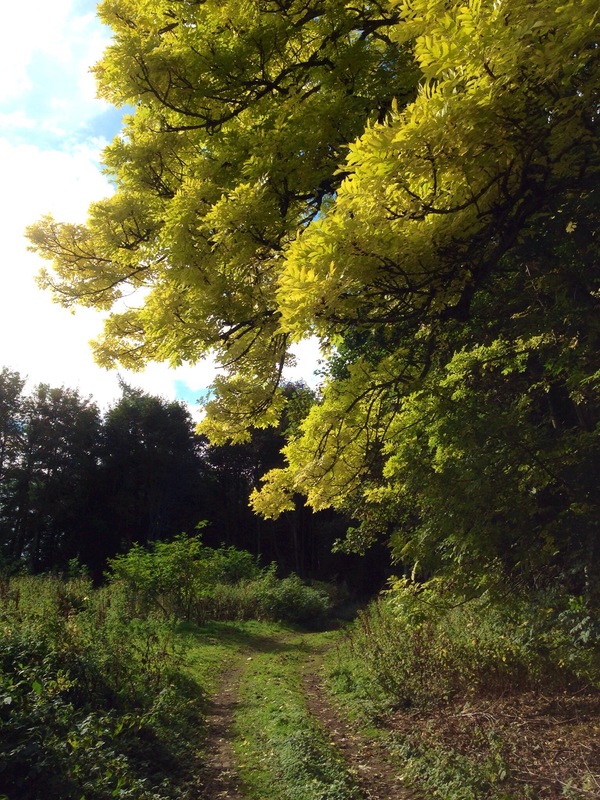 For this week’s autumn colour, the Ash (Fraxinus) takes centre-stage. They have transformed in the last 7 days or so from mid-green to bright yellow. We have a smallish tree in the garden but there is a large one on the Estate and this is the one I’ve pictured. It stands out like a beacon amongst the other trees and, even if the sun is not shining, it creates the effect that it is. But when the sun does come out, the effect is outstanding! This has got to be one of my favourite autumn treats! The season of seed-setting, berry-forming and fruit-bearing is well underway now. 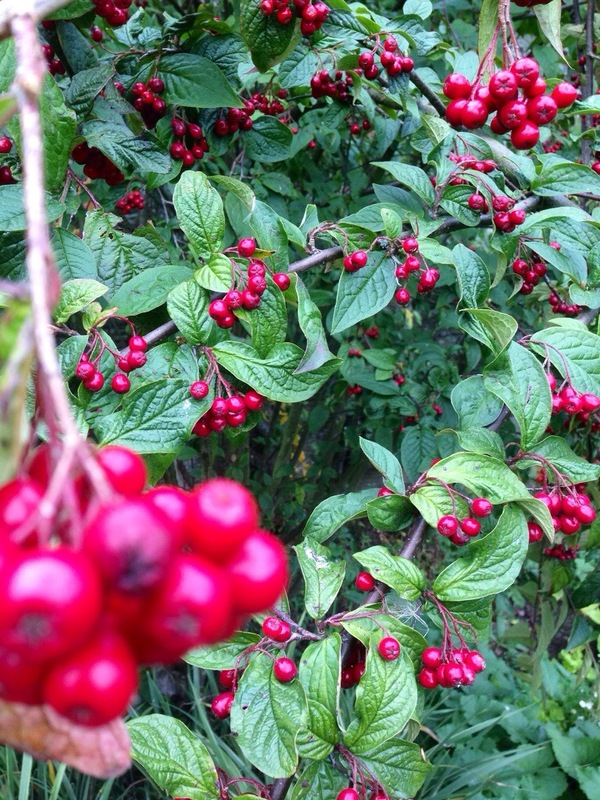 The cotoneasters are looking particularly good at the moment with red berries a-plenty. This is a great family of shrubs as, following the berry season, you invariably have wonderful autumn foliage colours to enjoy – all shades of red, orange and gold. Walking past our sunflower border yesterday, I noticed that some small creatures (birds, maybe field mice) have been extracting some of the new seeds from the dinner plate-sized flower heads. Sunflower seeds are high in fat content so this should help to see the diners through the winter! One family of plants that does very well here, providing a floral show from August to the first frosts are the Japanese anemones. They have attractive foliage and seed heads too and seem to do very well in deep shade. But floral longevity isn’t everything. There’s a lot to be said for the seasonal show-stoppers offered by the bulb family – short blasts of temporary interest. I’m quite a fan of the Colchicum family – Autumn crocuses we used to call them, not to be confused with the true crocuses that also flower in the autumn. We’ve grown varieties like ‘Water Lily’ (pink, double-flowered) in our other gardens, but here we have the simple C. album – pure white with yellow stamens. In the spring, I discovered a large clump at the back of the herbaceous border and transplanted some to front -of-border positions elsewhere. 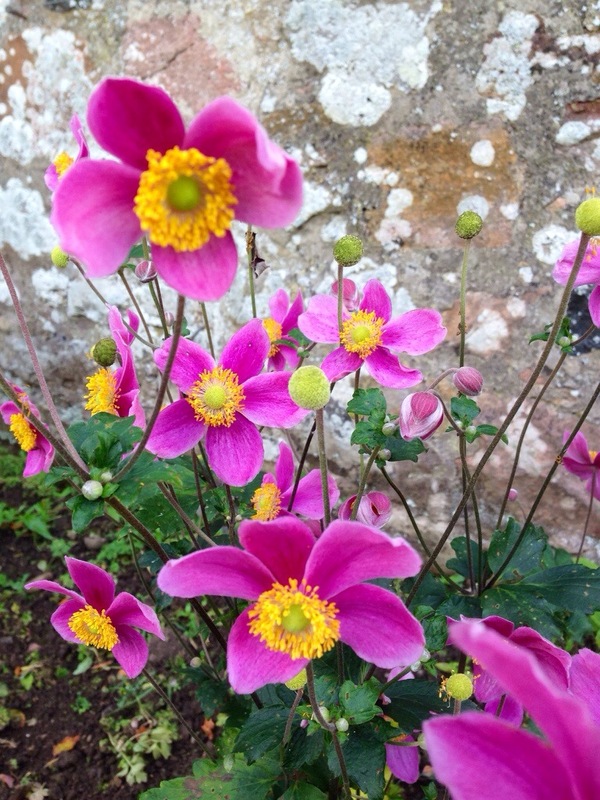 Happily these are now flowering, showing that the transplants have been successful. The only downside? Large green strappy leaves that come through in the spring, but they don’t last for too long. Small price to pay, perhaps, for the flowers-only show in the autumn! Fewer insects around now in the garden, although the ‘Indian Summer’ has been kind to those that remain. Just last weekend, we saw a large dragonfly hovering over the pond, looking as if it was laying its eggs. A good number of butterflies, now mainly Peacocks and Red Admirals, can still be seen on a wind-free sunny day, particularly enjoying the Verbena bonariensis. 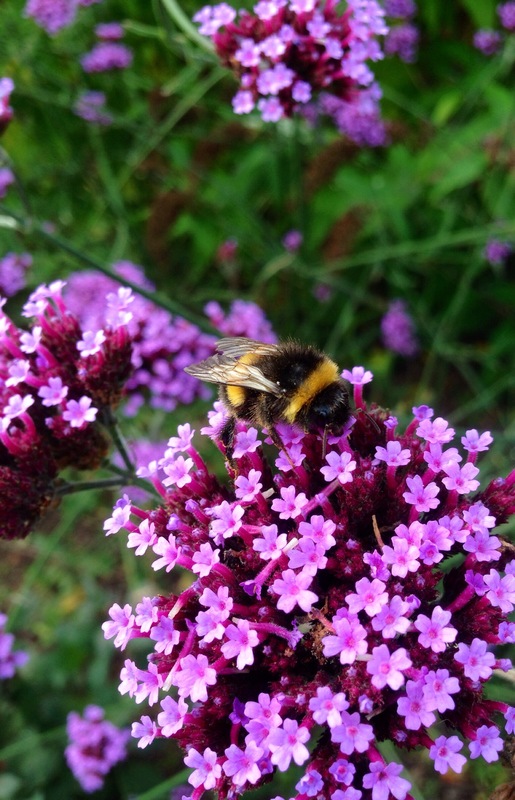 Indeed, this is a popular food plant for bees, particularly Bumbles, which now appear a little more lethargic. This entry was posted in The Walled Garden and tagged ash, autumn colour, Autumn crocus, autumn foliage, autumn leaves, berry, bonfire, bulb, bumble bee, Colchicum, Colchicum album, Cotoneaster, countryside in autumn, dragonfly, Fraxinus, fruit, Indian Summer, Japanese Anemone, Peacock Butterfly, Red Admiral, seeds, sunflower, Verbena bonariensis by The Scottish Country Garden. Bookmark the permalink. Thanks Malc – glad you enjoyed it! The ash trees really are this bright, I haven’t been hand-colouring them!! Oh what a shame! Perhaps you’ve had a very dry summer? Some of our trees started to ‘shut down’ early as a result of dry midsummer. your photographs are so lovely – I look forward to your posts! Thank you – how kind! I’m glad you enjoy them! Greetings from south east Scotland! Sorry to hear that a disease threatens that amazing ash, the color glows and the dark branches are a great contrast. It could easily compete with any New England maple! The bonfire looks like fun and I love the closeup of the bee. Thanks for dropping by, bittster! 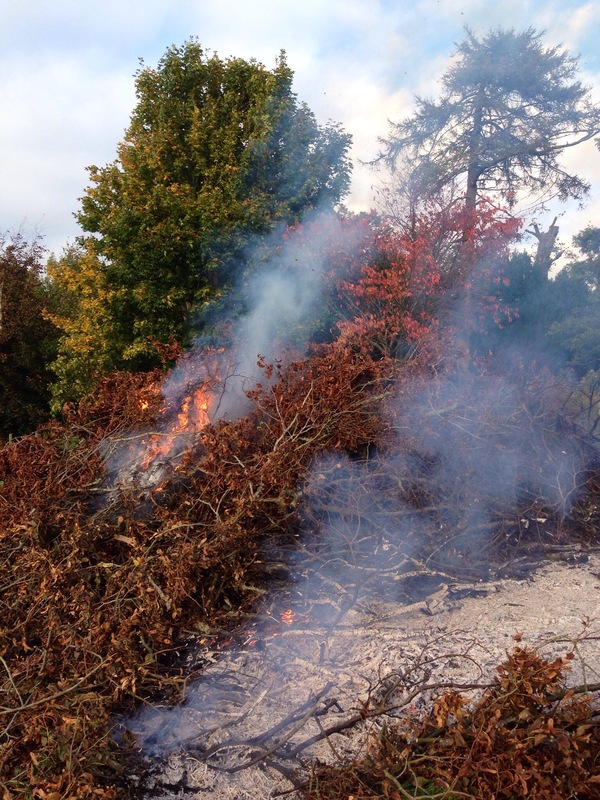 Ash Die-back is becoming quite a problem in the UK but more prevalent in the south of the country. The insects are a little more dopey at this time of the year making photography a little easier! That ash is gorgeous! 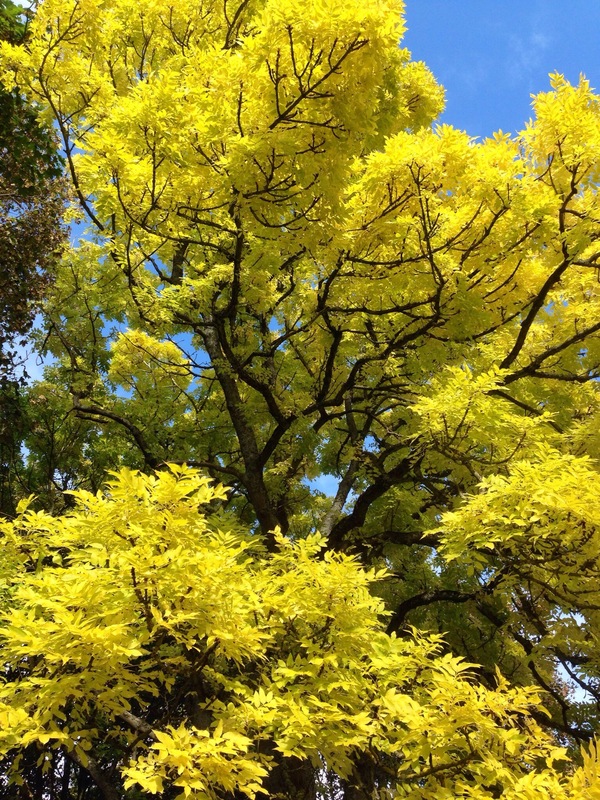 I have ash trees in my garden, too, but they must be different type because they’re not as vibrant. But our dry weather could also be a factor. That’s very interesting, thanks for this! Wow, your ash looks amazing! Down here in the south all they do is wither and look terrible with die-back disease. Fortunately, Alice, there is no sign of ash die-back on our trees yet but I guess it’s only a matter of time… Commiserations to all those who are seeing their trees succumb to this terrible disease. Hopefully disease-resistant strains will be identified soon.